Welcome to Best Western Plains Motel! The Minuteman Missile Site is near our Wall motel, but that's just one of the attractions that bring guests to the region. When traveling in South Dakota, visiting Mount Rushmore is nearly a requirement. The Badlands National Park is also nearby, and it's a haven for outdoor lovers, campers, and hikers. Birding is a big pastime, and getting back in touch with Mother Nature is simple here. If you really want to experience the beauty of the region while still enjoying the comforts of home, our Wall motel is the perfect place for you. Wall Drug Store was founded here, and it's an interesting stop for history buffs or those looking for a touch of culture on their trip. However, other guests prefer to just kick back and relax. Our Wall motel has an indoor pool, outdoor pool and hot tub for your comfort. Spend the days soaking in the hot tub, or cool off on those hot summer days with a dip in one of the pools. Our free continental breakfast ensures that every day is started on the right note. Enjoy a generous spread of waffles and pastries, a cereal bar and yogurt selection, along with your favorite fruit. Start the morning with endless chilled juices or coffee. If you're here for the Wall Celebration in July, you'll need a hearty breakfast to really enjoy all of the festivities. There's also a golf course nearby, and it's a favorite spot for guests of our Wall motel to work on their swing. We're the only motel in Wall with an indoor pool, for our guests to take advantage. Rodeos and a parade abound in July, and it's fun for the whole family. With free high speed Internet, in-room coffee and an iron and ironing board in each room, our pet-friendly motel is guaranteed to make your stay in South Dakota even better. Reserve your spacious Best Western Plains motel room right now for a great value! From: Interstate 90. Take Exit 110. 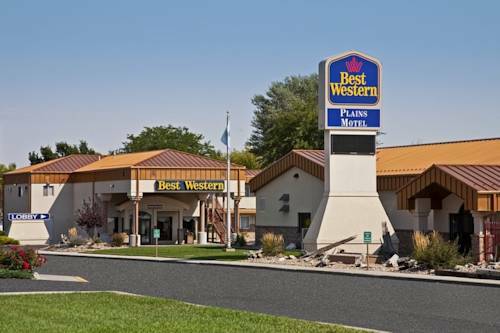 The Best Western Plains Motel is located two blocks from the exit.